we return you to an event "powers being"
...history's most incredible UFO event." Frank Feschino will be back for an expanded discussion of his new Flatwoods Monster book: The Braxton County Monster-REVISED EDITION-The Cover-Up of the Flatwoods Monster Revealed! Side-kicking for Frank will be Alfred Lehmberg of UFO Magazine with discussion regarding how Flatwoods is just the end of one iteration... of a much larger story. During the biggest UFO flap in US history, the 1952 Summer Of Saucers, our military was ordered to SHOOT those UFOs down... many men and aircraft were lost in the enterprise... why are these men forgotten in the main, and where they are not forgotten, why are they ridiculed? We know the answers to these questions... all of us! UFO Expert Tracks "Flatwoods Monster Case"! UFO Expert Tracks Flatwoods Monster Case! The amazing headline that day in 1952 wasn't from Amazing Stories, that science fiction magazine. Instead the headline — "Saucer Talk in 4 States" — appeared on Page 2 in the Sept. 13, 1952 edition of the Daytona Beach Evening News. The Associated Press story, datelined Baltimore, reported that "a fiery object that streaked through the night sky with a 'great greenish white light' stirred 'flying saucer' talk among residents of four states from Maryland to Tennessee last night ... Persons throughout Virginia saw what they variously described as 'a big star,' 'a flying saucer' and something 'like a flaming jet plane.' "
The AP story also appeared in The New York Times, The Washington Post, The Boston Globe and dozens of other newspapers. PRESENTS....Daytona's largest and longest running Halloween event !!!! 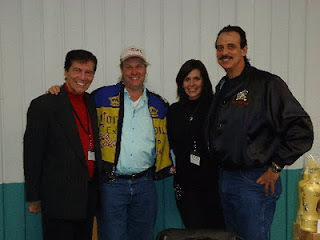 With Professor Lester and Lady D.
OWEN SLITER'S SPOOKHUNTERS RADIO BROADCASTING LIVE !! of the infamous Flatwoods Monster case. Cryptozoologist Scott Marlowe as seen on William Shatner's TV show, "Is it weird or what?" Legend Tripper, Rob Robinson, from the Wife Swap TV show. REMINDER: Frank will be in Charleston, West Virginia on 13 & 14 October for the "Official West Virginia" release of his new book. This 2-day event will be held at the Civic Center for the 2012 West Virginia Book Festival. Frank will be set up in the "Marketplace" at booth #603 for a book signing with colleague Alfred Lehmberg and guest Johnny Barker. For further information please go to http://wvbookfestival.org then click on the "WV Book Festival Blog" link to read the September 14, 2012 article posted by Greg Moore of the Charleston Gazette. 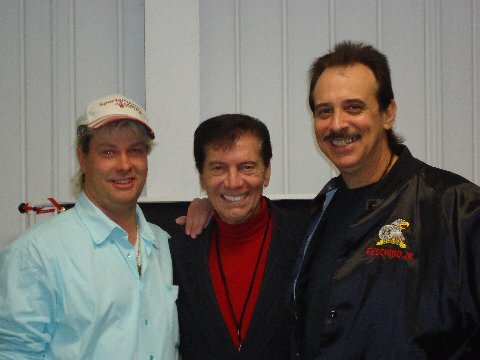 Rich Dolan and Frank Feschino! One half the ufological quadrature! The Allan Handelman Show deals with all issues relevant to the Rock Culture, not just music. Rock Stars, newsmakers, pop culture icons and always the most amazing people in the world. Hear all sides of the story and listen to a variety of media. Then, make up your own mind. It's the Talk Show for people who don't even listen to talk shows. Follow me on Twitter and visit my YouTube channel! Second Sunday feed 10pm-1am ET from Allan's UStream.tv channel. This stream repeats throughout the night. The Braxton County Monster-REVISED EDITION-The Cover-up of the Flatwods Monster Revealed. Stanton Friedman adds commentary and insight as, together, they ring this thing out! I'm gonna try to call in! 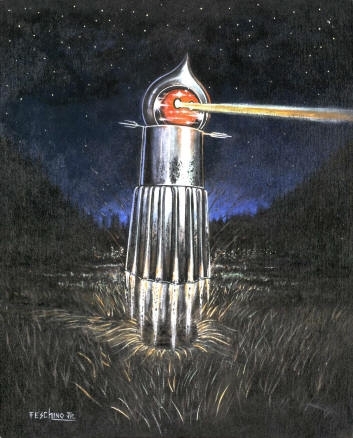 In the aftermath of the terrifying "Flatwoods Monster" and "Frametown Monster" incidents occurring in Braxton County on September 12th and 13th in 1952, yet another alien "Monster" was said to have been sighted in West Virginia on Monday, September 15, 1952. This incident occurred near Wheeling in the Vineyard Hills Housing Development about five miles from the famous Oglebay Park Resort. Only three days earlier, during the September 12, 1952 UFO flap at Flatwoods, a damaged UFO had gone down in the Oglebay Park area. Not as well-known as the two previous Braxton County close encounters recently recounted, this mysterious "Monster" incident also reflects the incidence of being quickly covered-up by officials. 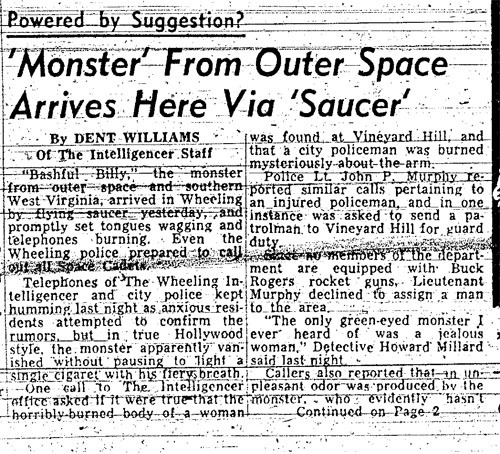 On September 16, 1952, an article on the front page of the Wheeling Intelligencer reported, "'Monster' From Outer Space Arrives Here Via Saucer." The opening stated, "'Bashful Billy,'" the monster from outer space and southern West Virginia, arrived in Wheeling by flying saucer yesterday and promptly set tongues wagging and telephones burning." Notice the reflex ridicule in the article above. The article also stated, "One call to the Intelligencer offices asked if it was true that the horribly burned body of a woman was found at Vineyard Hills and that a policeman was burned mysteriously about the arm... Callers also reported that an unpleasant odor was produced by the monster." Similar bells seem decidedly rung between this and the previous two affairs at Flatwoods and Frametown. The Fairmont Times article of September 16, 1952, "Green-Eyed Monster Again Reported on Loose in state," reported that "Bashful Billy" was a "10-foot tall monster from another world" and was said to be "gas-breathing." Was the "body of a horribly burned woman" really found by the Wheeling locals on the pandemonium that was Monday in Vineyard Hills? Or, was this the cover story to hide the truth of a horribly burned alien body found there after being dropped off from a damaged UFO three days earlier during the September 12 flap? Curious and more curious, still. The Wheeling Intelligencer continued to follow this "Monster" story. On September 17, 1952, it reported yet two more sightings of another monster called a "roving monster." These sightings occurred on Tuesday September 16, 1952 in nearby Ohio. One caller contacted the Wheeling newspaper and reported that, "his grandchildren were 'almost scared to death' by something they had seen." Another Ohio caller reported, "It was 10-15 feet tall and had a green body and red head." More familiar bells! Was this "roving monster" actually another alien looking for the ostensibly stranded alien found dead already by the Wheeling locals the day before? What was happening "really," in the center of West Virginia? 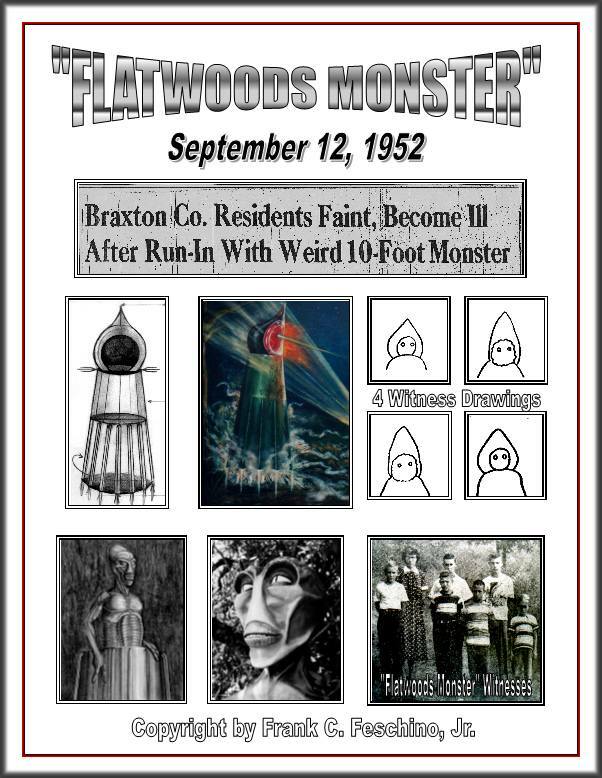 Read the entire story, all the accompanying articles regarding these amazing incidents, and other documented incidents provoking hapless locals into a terrified frenzy... in Frank Feschino's new book, "The Braxton County Monster-REVISED EDITION-The Cover-up of the Flatwoods Monster Revealed." This is real. The Braxton County Monster Returns? Twenty-four hours after the "Braxton County Monster" incident occurred in Flatwoods, yet another terrifying alien close encounter occurred in Braxton County, about 17-miles away in the Frametown area. On September 13, 1952, George Snitowsky, his wife Edith and 18-month son were driving through the mountainous roads from Frametown, on their way back home to New York. Abruptly, their car inexplicably stalled and died by the deserted and car-less roadside. George attempted to start the car but to no avail. Suddenly, the air around him became engulfed with a noxious foggy mist smelling like a mixture of ether and burnt sulfur. Moments later, just after he'd gotten back into his car, a dazzling beam of deep purple light flashed across the hood! It emanated from the nearby woods. The scene quickly became dire as the stench penetrated the interior of the car and the baby started crying uncontrollably. As everyone was gagging and heaving, George got out intent on investigating the brilliant light in the woods. As he got closer to it he was to become dumbfounded when he clearly saw a glowing UFO hovering behind some nearby trees! Electrical charges filled the air along with the sickening stench surrounding him, he quickly turned and headed back to the relative safety of the car. As George neared his car, he staggered, briefly, against a tree attempting to regain his balance and catch his breath. Suddenly, a blood-curding scream filled the air as Edith tried to warn George of the impending danger behind him. Clutching the baby, the hysterical wife pointed to a huge 9-foot tall alien that was hovering in place about 30-feet away from him. George's knees buckled when he turned and saw a huge reptilian-looking being! He was later able to describe the alien as having a bloated body with long spindly anthropoid arms forking into only two thick, if equally spindly, fingers. Suddenly, without any warning, the being moved towards him. George said the figure seemed to glide acoss the surface of the road. He further described the lower torso as being a solid mass, a conveyance. Furthermore, it was the source of the sickening sulfur permeating the air. 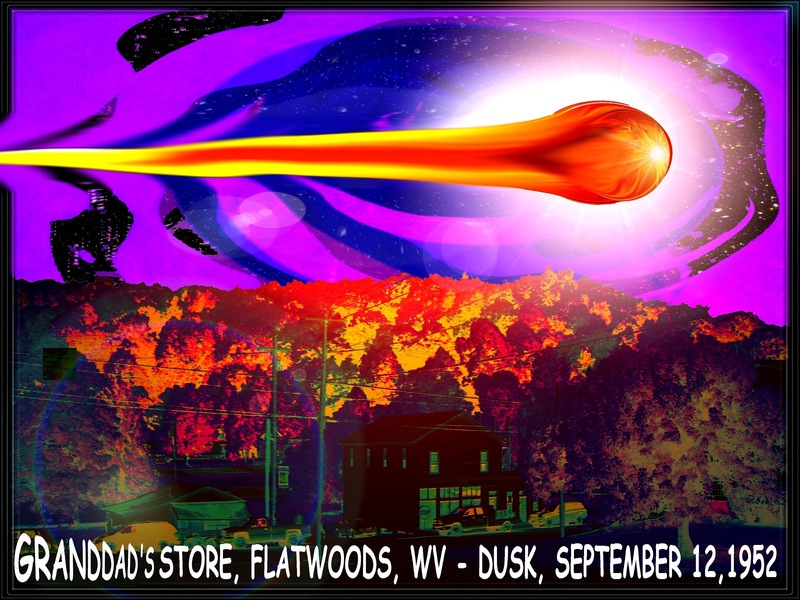 Around dusk on September 12, 1952, the small country town of Flatwoods, West Virginia slipped irretrievably into a real-world Twilight Zone. By report: A flaming UFO flew directly overhead at treetop level, made a hard 90 degree left turn, and then settled behind the trees on a hilltop just southeast of the location of a small group of witnesses standing, justifiably, slack-jawed! Very shortly thereafter, several local residents went in search of the large downed "object," indeed landing nearby on the now famous Bailey Fisher Farm. During their intrepid quest to find the downed object, the group was abruptly terrified when they very unexpectedly encountered what might be the 12-foot-tall occupant of said damaged craft, after it had perhaps sought refuge along the bordering woods of the bare hilltop landing zone, but coming out at them from behind a huge white oak, lit up like a Christmas tree! 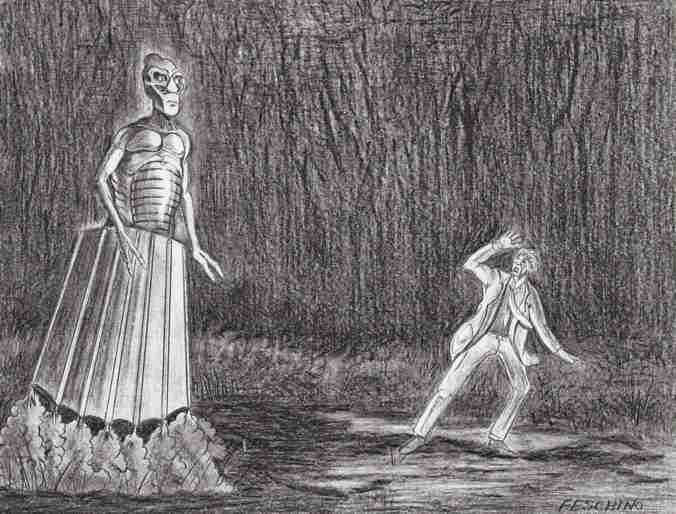 This "strange occupant," later called the "Braxton County Monster" or "Flatwoods Monster," was very likely a huge and hovering metallic-like structure acting as what might be called a vehicular probe or conveyance. The witnesses, often and from the beginning, compared it to a mechanical spacesuit... with something seemingly sentient inside; a "being," even... a "being" clad in a protective suit of armor. Within days, the story of the "Braxton County Monster" became as far-reaching as named newspapers and radio stations around the United States—mainstream media vociferously telling the story of this "gigantic unknown alien visitor"—will make it far-reaching! Not restricted to the United States, it was not to be the end of the story! One week later the two main adult witnesses—plus the Braxton County newspaper reporter involved—appeared on the very popular national TV Magazine show called, "We the People." Here, the television sketch artist hurriedly talked to the witnesses and so very incorrectly illustrated this giant mechanical occupant—rendering it instead to appear as a pumpkin headed, cloth hooded, and claw-waving "monster"— a monster wearing a sweet-sixteen skirt and hovering a foot or so off the ground! To add insult to injury, the Intelligence officials at Project Blue Book stated the witnesses "probably saw an owl perched on a tree limb" and that the "underbrush below" may have "given the impression of a giant figure." "In their excitement, they imagined the rest," it was said! Moreover, the alien occupant's damaged craft, which had flown additionally West over Washington, DC, in flames, landed in Flatwoods! It was officially claimed to be "the well-known Washington area meteor." Folks, that "meteor" was in the air over 21 hours, flew at slow speeds and changed direction many times! I'll let the reader decide what kind of meteor it was! Yes, a cover-up was quickly put in place as Americans panicked over the already record amount of UFO sightings occurring over the United States that whole year! Furthermore, the Flatwoods incident occurred only six-weeks after the USAF had ominously revealed, to wit: that "the jet pilots are, and have been, under orders to investigate unidentified objects, and to "shoot them down," reader, "if they can't talk them down"! Cue the crisis music! Over the years, the story became fatuously and grossly distorted! Rumors ran riotous, rampant, and roughshod over the townspeople! Said townspeople consequently became tired of the insulting inconsistencies written about the incident. 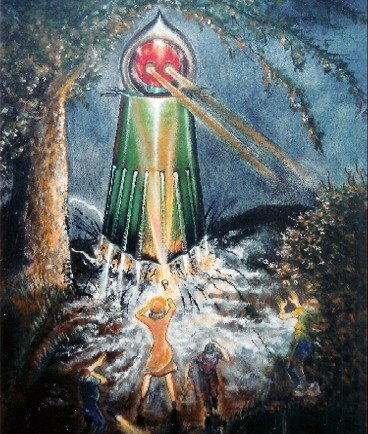 The eyewitnesses, themselves, were subsequently singled out for special attention—were ridiculed tirelessly and mercilessly—while the "Flatwoods Monster" was written-off and relegated, over the years, to a quaint West Virginia tale of "hillbilly folklore." The American government's massive cover-up of this close encounter incident was indeed a well executed plan lasting many years. ...But even the best of cover-ups have holes in them! Torn evidentiary seams eventually split open to reveal the truth! Forty-years after this amazing incident occurred; Frank C. Feschino Jr. discovered the "Braxton County Monster" story and began looking into it. That is when Aviation history was changed. Tirelessly, he has now spent more than twenty-years investigating the Flatwoods incident! This is the longest investigation ever conducted into the case in record, thus Feschino is THE subject matter expert on this astonishing event! 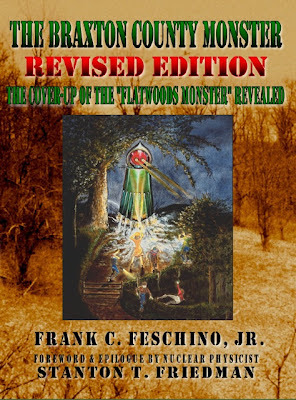 At last, sixty-years after the incident, Frank Feschino, Jr. has released his new book, "The Braxton County Monster—REVISED EDITION—the Cover-up of the 'Flatwoods Monster' Revealed." Now, the entire and non-redacted truth of this incident is told in Feschino's amazing book, which records this entire 20-year investigation! 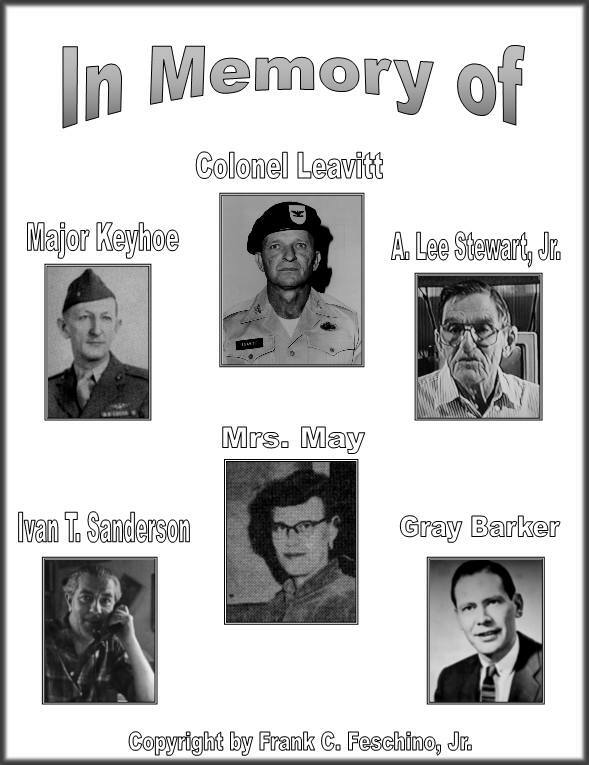 Most humbly, this being the 60th anniversary of this terrifying incident: Frank Feschino Jr., Stanton Friedman, and Alfred Lehmberg—among other significant colleagues—would like to take a moment to remember the Braxton County witnesses who worked unfailingly and unstintingly with Frank. These have since passed on during the writing of his new "Braxton County Monster" book, and live on only in the video and written record. Without them, the truth of "Braxton County Monster" incident could not be known. Colonel Dale Leavitt, WV National Guard commander in 1952, who went to the Flatwoods landing site with a heavy Battalion of Army troops shortly after the incident. Mrs. Kathleen May, primary eyewitness to the "Flatwoods Monster," who came within a few feet of the figure during her close encounter. Lee Stewart, Jr, photojournalist who first interviewed the witnesses and then broke the "Flatwoods Monster" story to the news press. Margaret Clise, former Flatwoods Mayor, who saw the damaged craft fly over Flatwoods at low-level, just before it landed on the farm! Jack Davs, local businessman, who saw the damaged craft pass over Flatwoods and then land on the Fisher Farm a few moments later. Harvey Wolf, former aerospace physicist, who worked with Lockheed and assisted Frank with his research. A special rememberance to USAF F-94 fighter pilot 2nd Lt. John A. Jones, Jr. and radar observer, John DelCurto. These men both perished in their jet on September 12, 1952 under mysterious circumstances. In honor of the 60th Anniversary of the Flatwoods Green Monster, a special thank you goes out to stalwarts John Clise, doting son of Margaret above and the editor of the "Central West Virginian" newspaper, the witness Fred May, the whole of the May family, and all the other families, witnesses and assistants who worked with Frank to tell the real story of the "Braxton County Monster" in his new "REVISED EDITION." Near last but not least, Frank and his colleagues wish to thank Mr. Larry Bailey of Brothers Bailey Promotions for his professional support with this project and a special thank you to the Law Firm of Bowles, Rice, McDavid, Graft & Love, LLP, for making the book a reality. and the 60th anniversary of the incident! Also appearing on this program with Frank is Stanton T. Friedman, "look upon ye works, "SuperSoylent" and despair! Frank is the lead investigator and historian of the strange event involving a mysterious creature known as the Braxton County Monster which occurred on September 12, 1952. The creature, often referred to by names such as the green monster, Flatwoods monster, and other names resembles a living being of otherworldly origin, in a metallic exoskeleton that was sighted in Flatwoods, West Virginia on the Fisher Farm. Frank will discuss the mystery once again along with his latest discoveries involving the case, the Flatwood's monster government cover-up, creature descriptions, event history, and more! What exactly did the witnesses see that night? Where did the creature come from? Join the BFP Panel and Frank Feschino Jr. on this memorable night in celebration of the 60 year anniversary of the Braxton County Monster! Super Soylent... But Not Very Salient! Exactly! I suspect that's what one should do with uncorroborated, biased, and inaccurate reportage from anonymous and voice-boxed blockheads reporting from cowardly shadows with only the ax of their facile and unimaginative debunkery to grind, eh? To wit: "noisome negativists," who laugh up damp sleeves at that which they have no capacity to understand, no aptitude to accept, no ability to incorporate, and no skill to recognize! Since the 2004 edition of this book was printed, Frank continued his relentless Flatwoods research and added much more information to this new updated book. Over the past eight years, we continued to collaborate, met at several UFO confernces and discussed his recently found information. This information includes Air Force documents that supply evidence connected to the UFO events of September 12, 1952. This new information contained here, fits into the timeline of events that Frank has established and shows us that a massive cover-up was indeed in place. His explanation of a six-foot tall barn owl and a meteor crash is absurd...Astronomy experts have provided Frank with the fact that there are only three instances on record in West Virginia of recovered meteorites and none were on September 12, 1952. A six-foot owl that puts out a noxious vapor, has never been reported before or since, and certainly sounds like trying to fit a square peg in a round hole...especially when here was no report of moving wings. All the eyewitness testimonies of the so-called "monster" actually indicate it was a mechanical device about 12-feet tall. The myth of the so-called "monster" has finally been revealed in this book. Pilots, witnesses or persons who have any information about the Flatwoods case can call me toll free at 1-877-457-0232 . 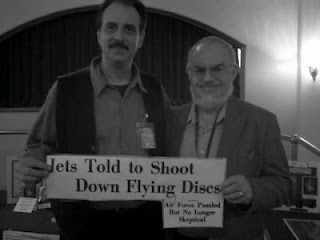 Stanton T. Friedman Permission granted by Frank C. Feschino, Jr., author of "The Braxton County Monster-REVISED EDITION-The Cover-up of the Flatwoods Monster Revealed." Show time: 7:00 pm. - 8:00 pm. Author Frank C. Feschino, Jr. returns to the "Behind the Paranormal" talk show and joins hosts Paul and Ben Eno to talk about his latest book: The Braxton County Monster REVISED EDITION The Cover-up of the Flatwoods Monster Rvealed Feschino, who investigated the 1952 "Flatwoods Monster" for more than 20-years, will talk about his ongoing investigation and latest findings. A show not to be missed. IT'S HERE! IT'S HERE! IT'S HERE! Author Frank C. Feschino, Jr. has released his latest book after an ongoing 20-year investigation into the "Braxton County Monster" incident of 1952. 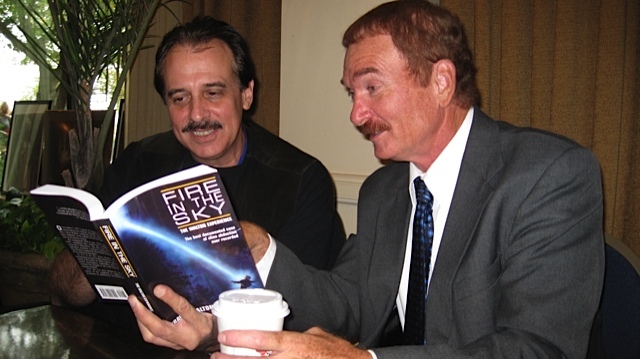 Feschino, who has become the authority of this well-known UFO close encounter incident, has researched and investigated this case longer than any other researcher in American history. Thought by many to be a "folklore" story involving a skirted "Monster," the author shatters that old tale and takes the reader on an in depth journey into the UFO events of September 12, 1952 and reveals there was much more to the original incident than the public had remotely realized. In his new book, Feschino explains the unfolding UFO events that occurred before, during and after the terrifying "Flatwoods Monster" incident and shows there was much more to the incident than a so-called "Monster" which roamed the mountains of Flatwoods and terrified a group of local citizens. By utilizing official United States government documents, Air Force Blue Book documents, first-hand eyewitness interviews, newspaper accounts and several other reputable sources, Frank C. Feschino, Jr. clearly shows how a massive cover-up was put in place by the United States government to hide an alien invasion on the night in question. Mr. Feschino's new book is a historical account about the "Braxton County Monster" incident. It is the most detailed and complete book ever written about the incident. What took the United States government a couple of days to cover-up took Frank C. Feschino, Jr. more than twenty years to unravel and uncover! You won't believe it, but it's true. The Cover-up of the Flatwoods Monster Revealed. Author Frank C. Feschino, Jr. and the "Braxton County Monster" Return for a 60th Anniversary Radio Show on "Alternative Talk KKNW 1150 AM" in Seattle, Washington. On September 7, 2012, Frank Feschino, Jr., the authority on the terrifying 1952 "Braxton County Monster" close encounter case will discuss his new book with famed "Alternative Talk" hosts Gary Mantz and Suzanne Mitchell. A great talk show with a gripping UFO story that you don't want to miss!!! By Frank C. Feschino, Jr. The "Braxton County Monster" Returns to West Virginia for the 60th Anniversary of the incident! Brothers Bailey Promotions of Charleston, WV. proudly presents the official "West Virginia" release of Frank Feschino's new 2012 "Revised Edition" book at the Charleston Civic Center. Author/Illustrator Frank C. Feschino, Jr., who led a 20-year investigation into the terrifying "Braxton County Monster" close encounter UFO incident of 1952, will be at the 2012 West Virginia Book Festival on October 13 and 14. Joining Feschino at booth 603 in the North Hall will be Veteran Master Aviator Alfred Lehmberg, US Army (Retired). 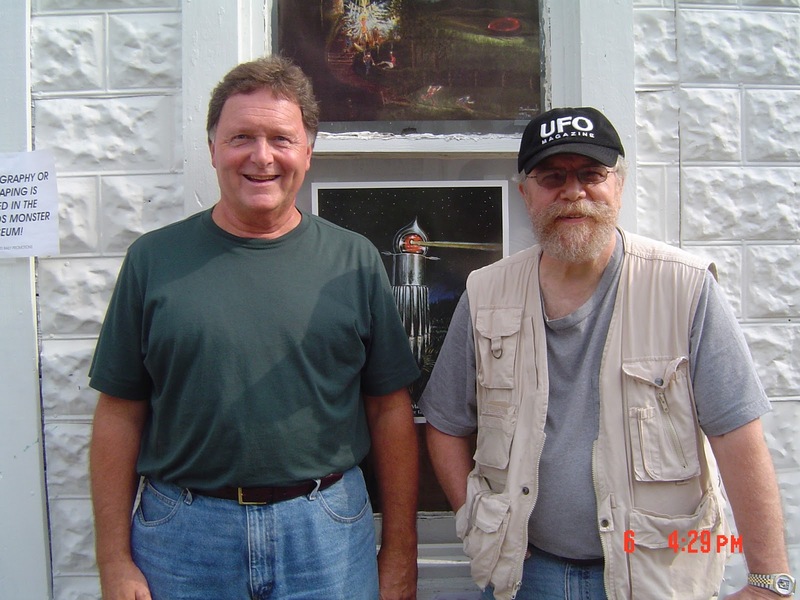 Mr. Lehmberg, a feature writer and columnist for UFO Magazine who contributed the book's cover review and has written extensively on the case, will be signing this groundbreaking book with Mr. Feschino during the 2-day event. For this special West Virginia book release event, Feschino will display some of the rare research material that he discovered during his 20-year investigation into the case and will also show his UFO documentary about the "Braxton County Monster," titled "Shoot Them Down." Come see the 12-foot-tall "Braxton County Monster" and replica "flying saucer" at booth 603 and discover why Feschino's new 2012 "Revised Edition" book is the true (and only) authorative book written about the 1952 "Braxton County Monster" incident. This action-packed 100-slide presentation documents the entire story of the "Braxton County Monster" incident and other terrifying events that occurred on September 12, 1952, during 21 hours of sustained UFO sightings. Mr. Feschino is presenting this new powerpoint to commemorate the 60th anniversary of the "Braxton County Monster" event. NOTE: Feschino, an author and illustrator, has also formatted his very visual powerpoint with subtitles and words that accompany his slides. This will enable hearing impaired persons to view and follow the storyline of his presentation. 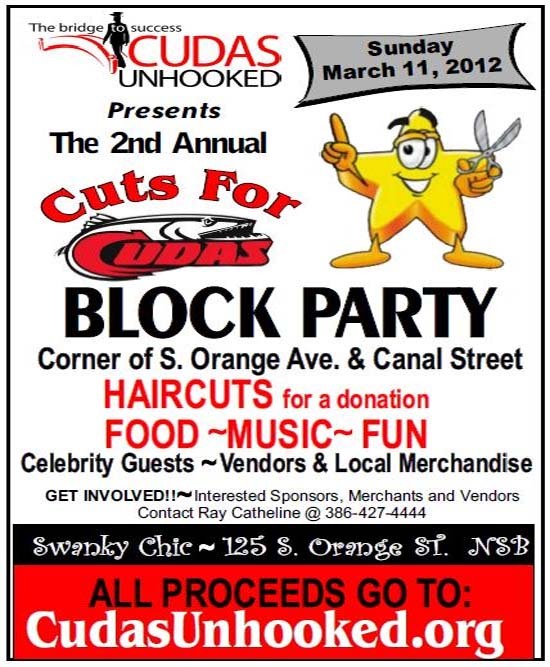 On March 11, 2012, Martial Artist, Sifu John Wilbur of the "CHI LING PAI Academy," will participate in the "Cuts for Cudas II" fundraiser event on Canal Street in New Smyrna Beach, Florida. 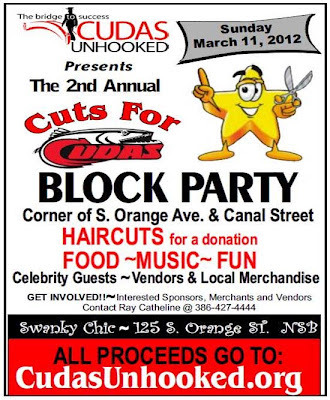 This wonderful community event is part of the "CUDAS UNHOOKED" program, which is dedicated to helping at-risk "Cudas" students graduate from New Smyrna Beach High School. The beautiful Canal Street region will be the location of several New Smyrna Beach businesses and vendors that will donate their proceeds to the kids of the Cudas Unhooked Organization. There will be lots of entertainment, activities, food and fun for the entire family. There are also some very special guests and celebrities scheduled to appear at some of these local business booths. This year, Sifu John Wilbur will have some special guests at his business booth on Canal Street. Appearing with Mr. Wilbur in support of this fundraisng event will be Author/Illustrator Frank C. Feschino, Jr. and Spiritualist Thom Angels. 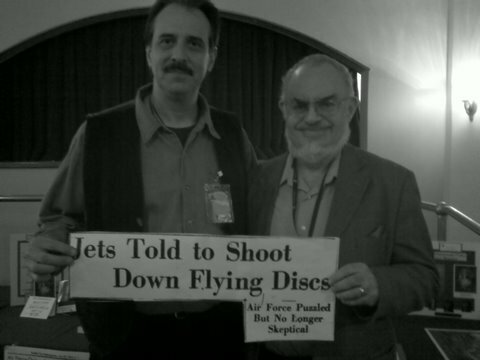 Feschino, author of "Shoot Them Down-The Flying Saucer Air Wars of 1952," has been featured on the History Channel TV show "Monster Quest." As the primary researcher and writer of the "Flatwoods Monster" UFO incident of 1952, Frank has also appeared on several TV news broadcasts and programs, numerous radio shows and featured in magazine and newspaper articles around the country. Spiritualist Thom Angels, will also make a special guest appearence and join Mr. Wilbur and Mr. Feschino at the "Chi Ling Pai Academy" booth that day. 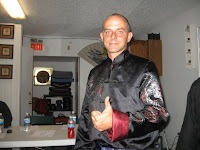 Mr. Angels, a "New Age" spiritualist, is reported as a very gifted and reputable psychic-medium from New York. Thom Angels, "The man Who Died and saw Heaven then Returned to Life," has allegedly helped countless people around the country during his travels over the past 20-years. He has also been featured on radio programs in the United States as well. Stop by the "Chi Ling Pai Academy" booth for the best in demonstrations, displays and great conversation and help support the "Cudas" kids. 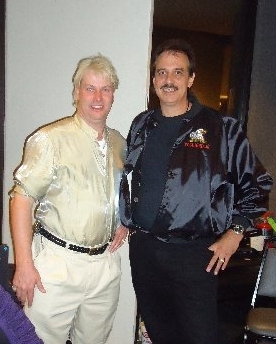 Thom Angels and Johnny Martino pose at the Promo ad for Martino's new book. 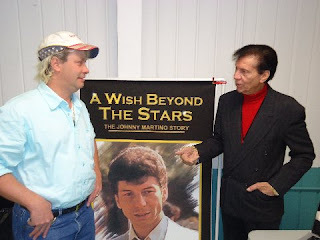 Johnny Martino talks to Thom Angels. Feschino, Angels and Martino discussing aliens, angels and actors. Marlon Brando in the movie, The Godfather. Thom, Frank and Johnny are all smiles after a Thom Angels prediction. On January 15, 2012, author Frank Feschino, Jr., caught up with Hollywood actor Johnny Martino and noted psychic/Spiritualist Thom Angels. 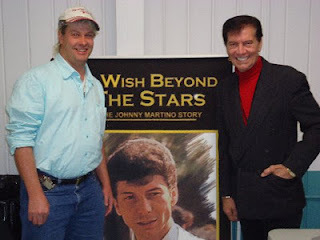 Mr. Martino was a guest at the Deland Collectable Show in Florida and was talking about his new upcoming book, A Wish Beyond The Stars. At the event, Frank and Thom spoke with Mr. Martino and had a special first-hand sneak preview of his latest book, which encompasses the actor's life. 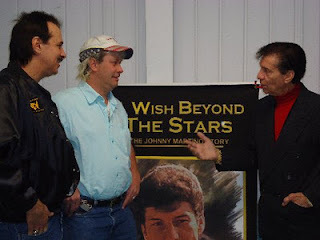 One review states, "In A Wish Beyond The Stars, Johnny will introduce you to Lucky Luciano, Pope Pius XII, Marlon Brando, Marilyn Monroe and John F. Kennedy. From New York to Hollywood, from Palermo to Rome—and even in Tin Pan Alley—Wishes do come true." At the show, the three men discussed some of the highlights concerning their work and talked about their book works as well. 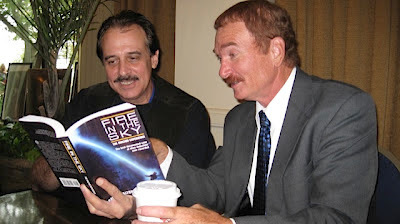 Feschino, author of "Shoot Them Down" will release three UFO books in the near future,while Martino is slated to release his book early this year. Meanwhile, NDE subject Thom Angels, "The Man who Saw Heaven" after he died and came back, is currently writing a book about his life and the amazing powers that he received while on, "The other side." Whether it be aliens, angels or actors, Feschino, Angels and Martino have something in common. They are all dedicated men in their fields and will always give it their all to give you a true insight into the worlds of their work.